1-CD-Album DigiPac (4-plated) with 56-page booklet, 31 tracks. Playing time approx. 80 minutes. The complete 1950s Starday recordings by this master of Texas honky-tonk music, including the hit version of Too Hot To Handle and the original version of A Place For Girls Like You, covered by Faron Young. Contains eight unissued songs and alternate takes, plus his two duets with George Jones. (Why, Baby, Why), his career was essentially over. There was a brief attempt at a comeback with United Artists in the early sixties before Sonny Burns disappeared back into the rural East Texas woods for good. 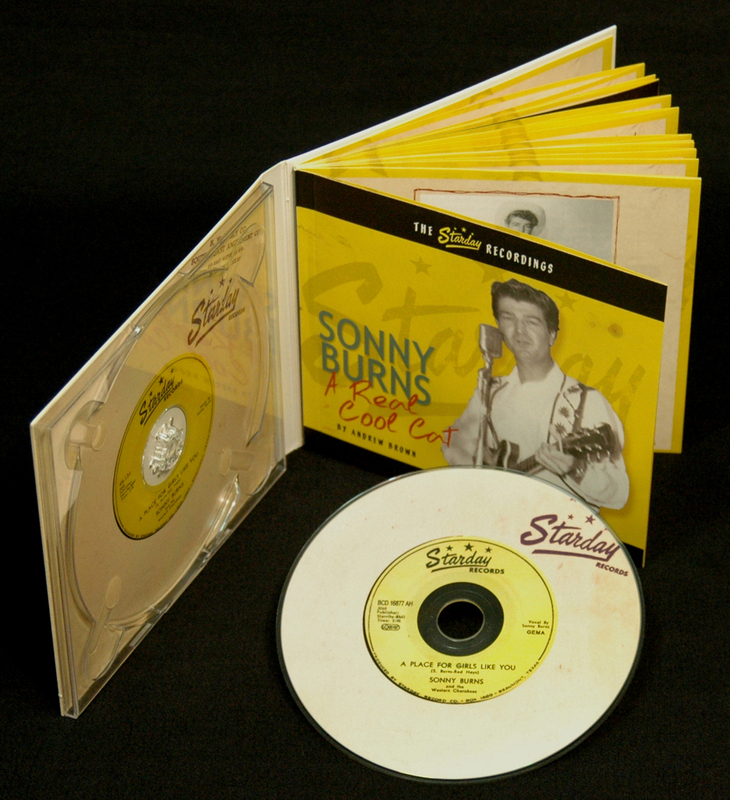 This Bear Family release gathers together for the first time the complete Starday recordings of Sonny Burns - all ten original singles, plus eight unissued songs and alternate takes. Most have been transferred from the original master tapes, resulting in the finest sound quality ever for these recordings. 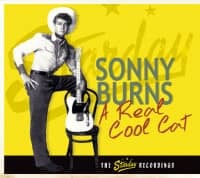 Having been unfairly relegated to footnote status in the George Jones Story in all previous treatments, this CD proves that Sonny Burns had a formidable voice all his own. 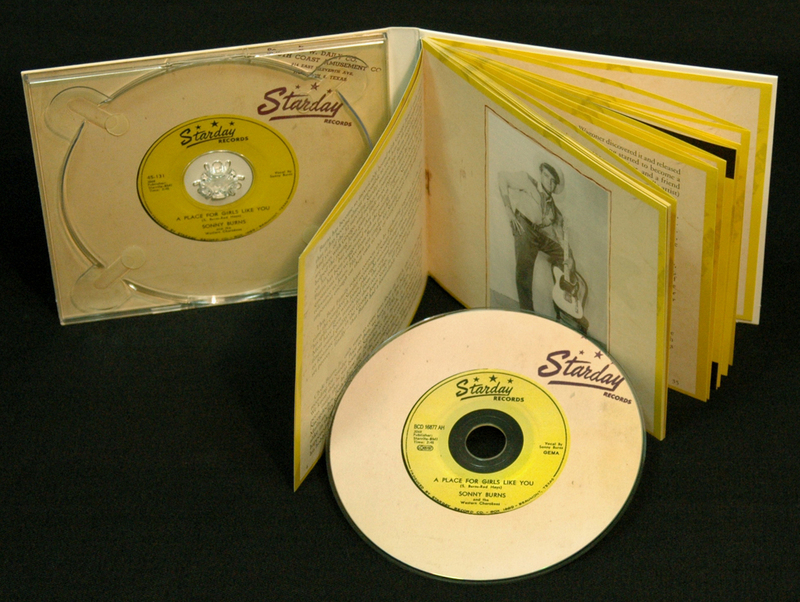 The set includes liner notes and a discography by Texas music historian Andrew Brown. Anyone reading about the implosion of Sonny Burns career in the mid-50s -- when the East Texas honky-tonk singer sank from sight while his friend, label mate and sometime duet partner George Jones rocketed to stardom -- might be surprised to find out that there was a 'Second Coming' in the 1960s. The story of Burns' first flirtation with fame, and his at least partly self-induced fall, is the stuff of country music legend because it has been so closely linked with the rise of Jones, the most revered country singer of the post-Hank Williams years. As good as he was, it's arguable that Burns would be regarded today as just another also-ran among many without the intertwining with Jones at that crucial junction. Instead, the Jones connection lends Burns a special aura, making his rise and fall one of the major 'what-if?' sagas of the era. There is an undercurrent in the way Burns' story is usually told that implies that the singer somehow got a raw deal, that were it not for one fatal mistake it might have been he who shot to stardom and not Jones. 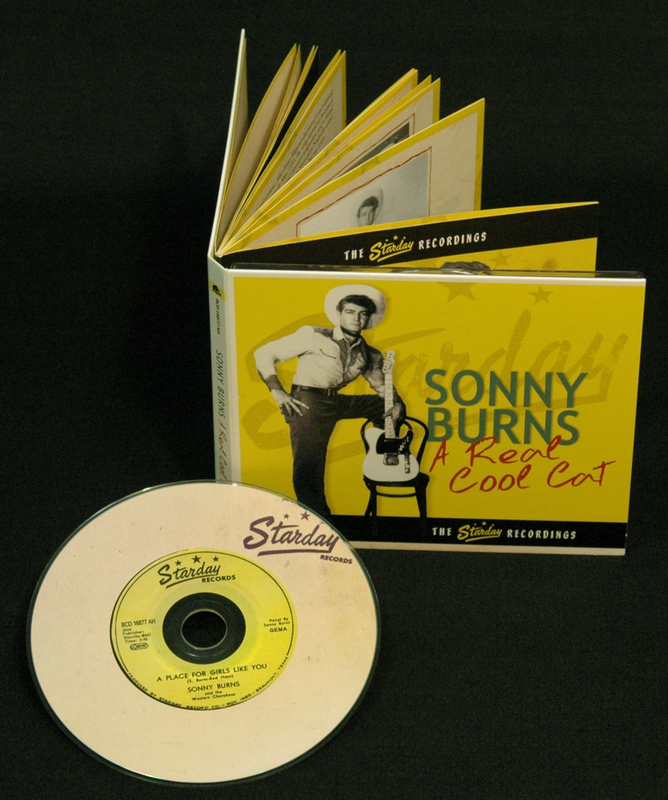 Andrew Brown, in his notes to 'A Real Cool Cat'Bear Family's 2011 release documenting all of Burns' early recordings for Starday (1954-56, including many unissued tracks), decisively debunks the myths and romanticism surrounding the singer's failure to make it big, while at the same time giving Burns' his full due as one of the most talented performers of the time and place. It was less a raw deal than a matter of timing and commitment. 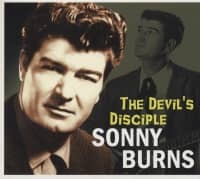 'Devil's Disciple,' which documents Burns' second stab at country music stardom in the 1960s, picks up where 'A Real Cool Cat' ends – or rather three years later in 1959, when having, in his own assessment, hit rock bottom, Burns began to claw his way back onto the scene with a single for the San Antonio-based independent label TNT. 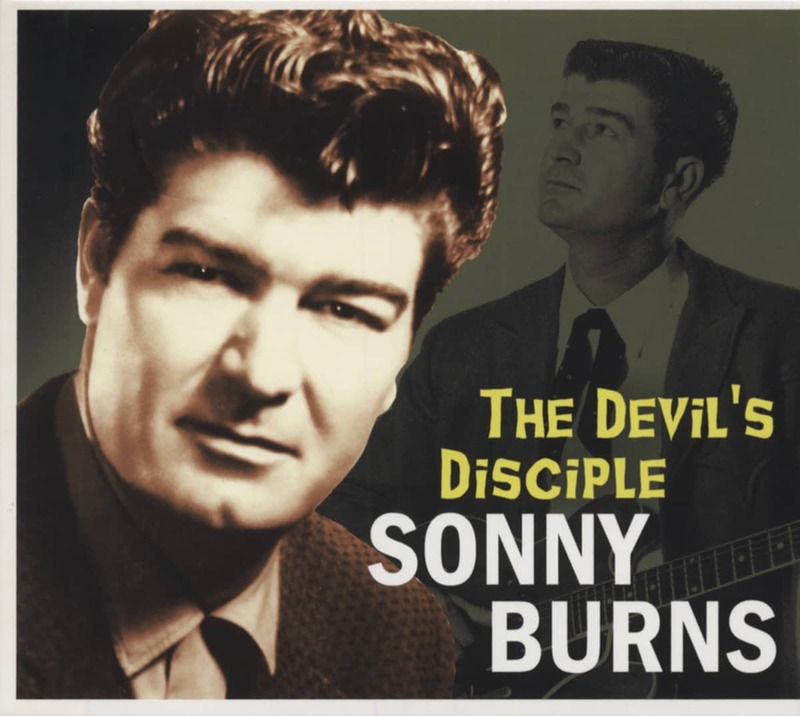 Following from that record, 'Devil's Disciple' traces Burns' comeback through his 1961-63 recordings for United Artists and his final 1968 session for MGM, which was left unreleased at the time and finally sees the light of day here. 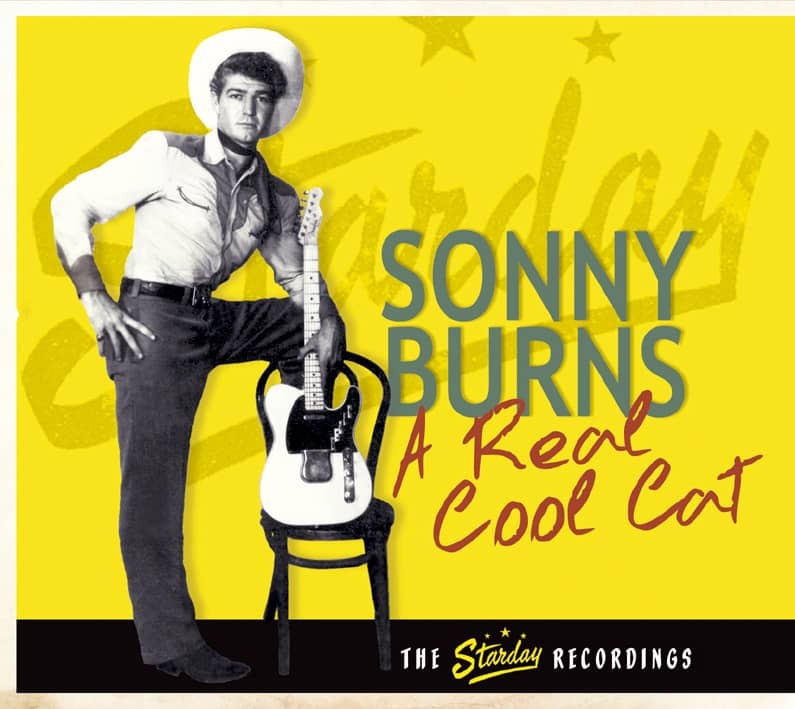 As Andrew Brown writes in his excellent notes to 'A Real Cool Cat,' Sonny Burns was born Clyde Burns, Jr. in Lufkin in deep East Texas on September 19, 1930 and apparently spent his formative years north of Lufkin in Nacogdoches before moving to Houston, part of the larger migration from farm and town into city that played so big a part in the city's golden era of country music in the early post-war years. We know little of his early musical influences beyond the claim by long-time local scene guitarist Harold Sharp that he and the teenaged Burns were buddies and that he taught the latter how to play guitar. In 1950, Burns was playing lead guitar for Eddie Noack and soon after had headed to nearby, wide-open Galveston, where he further honed his skills as a guitarist and also began to sing. By 1952, Burns was leading his own bands in Galveston and the following year caught the ear of Jack and Neva Starns of Beaumont, who'd started their own Starday record label in mid-1953. Burns was one of the label's earliest signees and he recorded his first single for the Starnses in the summer of 1953. His second release was his version of Noack's Too Hot To Handle. It was a regional hit, big enough to spawn several major label covers. The good looking, charismatic Burns became the Starns' most promising performer. 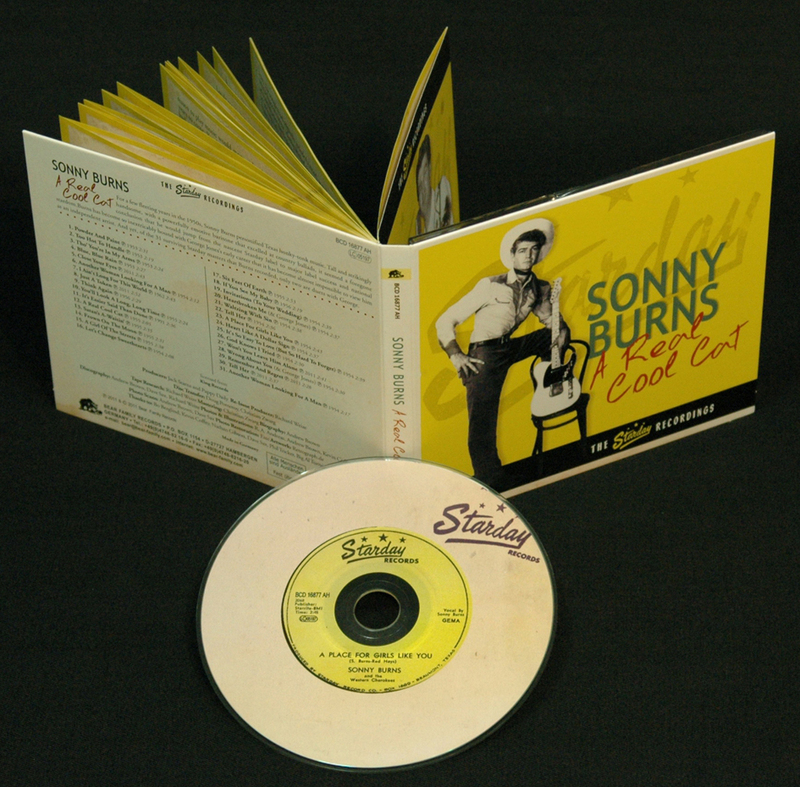 As Brown notes, Pappy Daily, who became one of the key players at Starday not long after Burns' signing, told historian Martin Hawkins that, "Sonny Burns was a fine, fine singer. His recordings sold well, too, consistently. We always had advance orders on them. He outsold George Jones by a mile. In fact, when we had them duet on a couple of discs, it was to help George's career, not Sonny's." Don Pierce, who became Daily's partner in the label after the Starnses bowed out, added, "We really did consider Sonny to be our number one shot." Customer evaluation for "A Real Cool Cat - The Starday Recordings"
This 31 tracker collects all the surviving Starday Masters.. Thanks Bear Family!